These two modes have different constraints. Mobile phone tests all use button presses as responses. Many tests use a two-choice (YES/NO, LEFT/RIGHT) response set, a few use numeric buttons. Some tests on the tablet are set up in the same way, with screen button instead of the phone keypad. Others involve a tap on part of the stimulus display, rather than on a separate button. For the core battery, stimulus displays have to be able to fit on a small screen, which can be as small as 96 X 52 pixels. They scale automatically to fit larger displays. There are a few tests that are available only on the tablet (see below). The platform we use most is the mobile phone, with a standard numeric keypad. Most of the tests use a two-choice format, with 4 used for LEFT or YES, 6 used for RIGHT or NO. 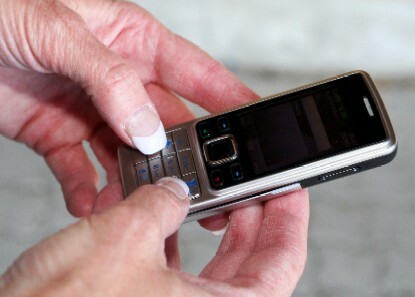 The phone is held as shown on the left, with the two thumbs over the 4 and 6 keys. Any phone with Java ("downloadable games") a screen at least 128 X 128 pixels, and a numeric keypad will run the core battery. This means that even many older phones will work OK. This is a great advantage, if you want to run tests on volunteers' own phones, as it means that many people will already have a suitable phone. If you need features like storing data on the phone card, we can do this, but it means that you need a reasonably up-to-date phone. This doesn't mean expensive - the phones we are currently using are priced at under £100 in the UK for pay-as-you-go. We generally supply packages configured for a specific project. The following tests are currently available for both tablet and mobile phones. Click on the test name for a description. Demos are available for several of the test. Instructions on running the demo are in the description pages. We have experience with administering tests using the web or a stand-alone PC. We can develop applications for these platforms on request. You can still obtain the original PenScreen battery on the Apple Newton, and used Newtons can still be obtained. This is a convenient and inexpensive route for small research projects.